Ahhh I never talked about my Lunasol Cheek Brush did I? I’ve owned it for months now and I love it! 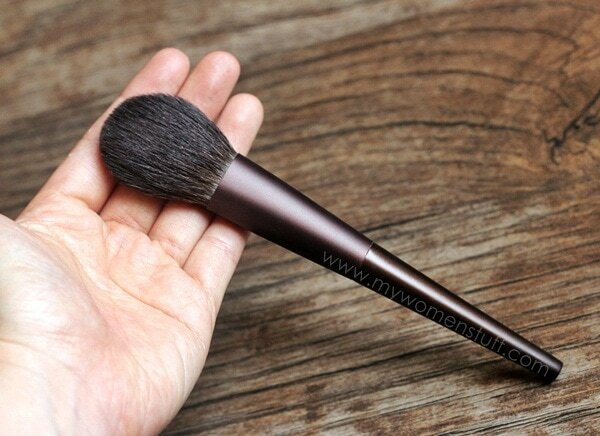 Its the only cheek brush, or blush brush as most of us will know it by, that I use daily. The Lunasol Cheek Brush N is a very lovely and soft brush made from 100% blue squirrel hair. Animal lovers may bristle (ho ho!) at this, but I’ve personally found that I get the best makeup results with natural hair brushes, especially for powder blushes so I’m sorry if this doesn’t do it for you, it does wonders for me. The brush is deceptively light. I say deceptive because I’m used to some heft in makeup brushes, mostly due to the wooden handles. The handle of the Lunasol Cheek Brush N is a light plastic maybe? And the ferrule is a light metal so the whole brush is light yet very balanced. The brush head does look a bit small, and if you come from the MAC blush brush circle, you may be a bit nonplussed to find that the head is flat and not round and fluffy. 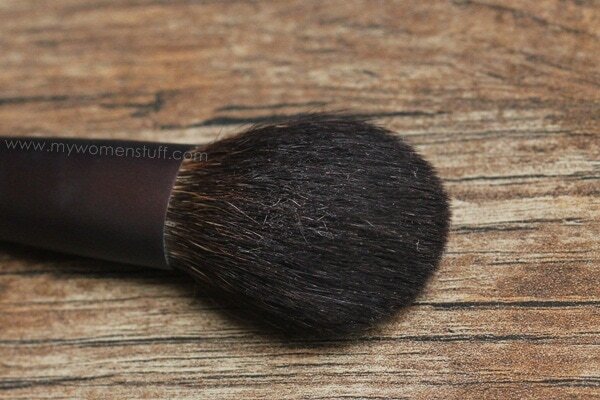 I used to use the Shu Uemura #17 Pony so I was quite used to the concept of a flat head blush brush. It places colour better and more precisely where you need it to go. Now, the bristles on this brush are about the softest I have ever come across. It most certainly is the softest that I own. I have read that the makers of Lunasol brushes are Chikuhodo, a famed brush maker from Japan. The brush is very well made, with each hair well placed so I don’t ever get stray hairs sticking out randomly. When I wash the brush, I just shape it back and when it dries, each hair has fallen back into place so the shape of the brush is as perfect as it was before. I like how balanced the brush looks. The shape is smooth and balanced. You can see that on its side, the brush is slightly flattened, but tapered so it is a little fatter around the middle, and tapers towards the top. From the top, you can see that it is well packed and dense, but yet it is soft and pliable. If I’m not mistaken, the hairs are uncut and arranged according to their natural length, so they don’t feel scratchy against skin at all. I have used soft brushes before, and one of my complaints is that soft brushes sometimes do not pick up colour very well. This however, isn’t true of the Lunasol blush brush. This one picks up colour very easily from all my blushes, no matter how pigmented or unpigmented they may be! Here’s how the brush looks next to the Shu Uemura #17 Pony and the Cle de Peau Cheek Brush reviewed here. Its larger than the other two, but not too large that it makes it hard to have exact placement of colour on cheeks. With a strong coloured blush, like the Tarte Natural Beauty I showed you earlier this week, I just lightly swipe the brush over the powder, dab it on my hand, and then apply it to my cheeks. I have no need for a stippling brush or a fan brush or any other brush one might use to diffuse a strong colour. This Lunasol brush picks up colour, deposits it where I want it to go, and when I blend, blends it out nicely so it looks natural. With a lighter blush, I swirl the brush around a bit to pick up colour, before I apply to cheeks and again, end up with a lovely diffused, soft blend of colour. 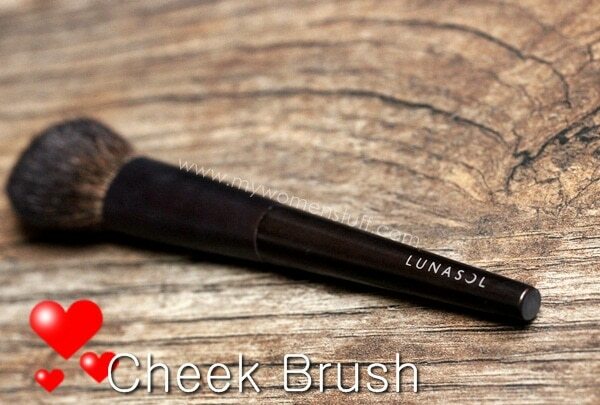 The Lunasol Cheek Brush N is a medium sized slightly flat cheek brush for applying powder blush. It is made from blue squirrel hair and the bristles are very lovely and soft. The brush is dense and very balanced in its make up, yet it is pliable and comfortably soft on skin, like a breath of air. I find that it applies and blends blush very well, whether pigmented or light colours. Ever since I bought this, I’ve not used any other! 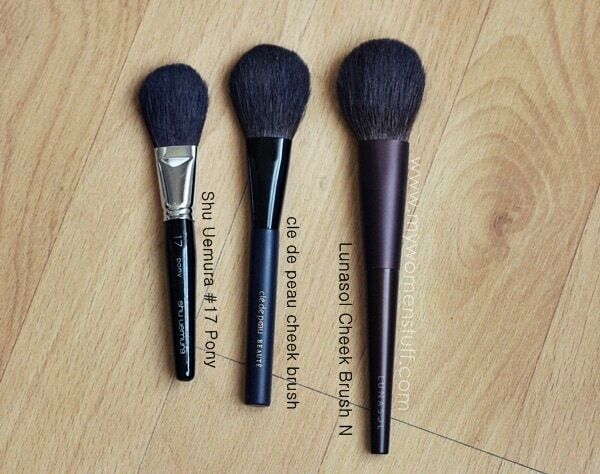 Do you own the Lunasol Cheek Brush N too? Love it as I do? I am told that the RMK Cheek Brush also performs very well and when I was contemplating my purchase, I dithered between the two. As the two counters were close by, I went from one to the other to feel the brushes before I took the plunge and I chose Lunasol because it just felt nicer to me. I prefer the texture and don’t find it too soft, and its made my blush application as near perfect and natural as it has ever been. I couldn’t be happier! I just clean it the usual way with baby shampoo or using Dove soap as per here. Looks good, though not terribly tempted because I’m currently saving up for chikuhodo brushes. I do have to go through escrow service to get those, but I’ve found the top notch quality to be totally worth it. That Lunasol brush looks nice! I prefer Asian brushes as they tend to be shorter than Western brushes and the quality is usually very good. I started off with long brushes (160-170 mm) available in the USA but realized much later that mid-length brushes (120-150 mm) available in Asia are easier to maneuver, especially if they are eye brushes where I needed to get up close to the mirror. Although I have small hands, short brushes (less than 110 mm) are also not comfortable as my hands get cramped around the short length. I replaced most of my brushes but it is a shame I spent so much before realizing that length played a role in ease of use, outcome and time spent in applying makeup. I have been thinking of getting this for over a year, every time I walk past a Lunasol counter I get very tempted. I eventually settled for a Hakuhodo but this has always been in the back of my mind. You are seriously tempting me! another brush courtesy of ParisB aka the enabler! Haha! I only enable you the best, Rudi! 😉 I hope you like it if you get it! hi pb! lovely review! Im soooo in love with lunasol brushes too! i have rmk cheek brush but much prefer the lunasol coz the handle is longer and nice to hold…have you tried the lunasol cheek brush S? its even softer and more pricey ( rm165 ) cant stop myself frm buying it! Hi pb! Yes its the retractable one…very nice for travel! I bought @ parkson pavillion..the Sa told me only 2 units available and its not displayed at the counter.. Do try ya! This brush sounds amazing! I’m a big believer in investing in the best brushes: If you take care of them, its a one-time expense (or at least they will last you long term), and they instantly make your routine easier and your application more flawless. Plus you use them every time you apply your makeup, so they’re definitely worth it! Revisit this because of your 2012 memoirs post! I washed my Lunasol blush brush a little while ago, and it made me sad when the volume died down after washing. haha, but I guess, I will have to use it to fluff it up. I love using this brush to get the diffused blusher look. But Paris, have you tried the Real Techniques Blush Brush? I think you will still prefer Lunasol, but gosh, I love that Real Techniques one as much as the Lunasol! I use them for different purposes, so it’s hard to compare. They’re so different anyway. By the way, I got NARS Yachiyo, and am disappointed in it by first impressions. It’s much more scratchy than most of my brushes (scratchy like Guerlain Meteorites brush), a little too tiny for blush, in my opinion. I find that it is better for contouring, down the nose, and in the cheek hollows. Yet, it’s not exactly a contour brush because it’s way too sparse (like Lunasol, has this sparse feeling), and therefore not stiff enough. Perhaps my I will love the Yachiyo when I find out how to optimise its use. Hi Victoria, I’m a lazy bugger so I actually don’t wash my brush as often as I should. I usually just tap the brush on the blush, apply to skin, buff it in a little and there’ll be very little product left on it. The next day, I wipe it a few times on a piece of clean tissue and pick up a new colour. Works well, and then I wash it at the end of the week (or when I remember 😛 ) Hope this helps!